The active, creative child is full of energy and has a vivid imagination. These characteristics can make it difficult for parents and teachers to understand the child and his or her needs. Many active, creative children are misdiagnosed as having Attention Deficit Disorder (ADD) or they're labeled as difficult. 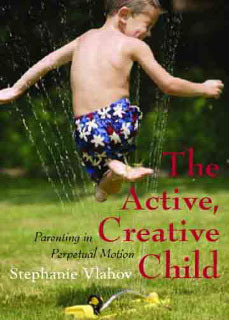 In The Active, Creative Child: Parenting in Perpetual Motion, Stephanie Vlahov helps us understand these children more fully by explaining how they think and what they need to stay stimulated without getting out of hand. She offers observations and tips on working with active, creative children. She then goes on to discuss the importance of imagination in the child's life, and the challenges they face when trying to fit in with other children. Finally, she outlines strategies that can be used to help active, creative children succeed in school ~ and within the family. If you are a parent of an active child who always seems to have more energy and a bigger imagination than his or her friends, I recommend you read The Active, Creative Child. It offers many practical tips on how to accept your child for who he or she is, and how to help them live in a structured society while staying true to themselves. I also recommend this book to teachers, as I'm sure every teacher has had at least one active, creative child in the classroom! Come back tomorrow to read a guest post from Stephanie Vlahov about how to help active, creative children in the classroom. This review was written based on a copy of The Active, Creative Child that I received from Pump Up Your Book in exchange for an honest review. That looks like an interesting book. I'll have to see if I can find a copy of it. I suspect I have a couple of those.